Dystrophic scoliosis secondary to Neurofibromatosis type 1 (NF1) may predispose to rib penetration into the spinal canal. No clear consensus was established regarding whether or not to resect the compressing rib head during correction maneuvers. The purpose of this study was to present imaging quantification of the migration of intraspinal-dislocated rib head in order to assess the extraction degree of dislocated rib heads and the associated influencing factors. 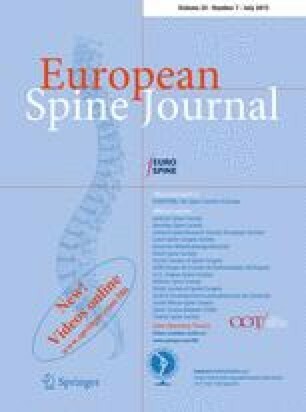 Imaging data of NF1 scoliotic patients with intraspinal rib head dislocation from March 1998 to April 2014 were retrospectively reviewed. The location and migration of the rib head were evaluated in a spinal canal-based coordinate system to calculate their pre- and postoperative vector coordinates. Differences in multiple parameters representative of rib head position were compared by paired sample t test. We also explored whether correction of vertebral rotation and translation could contribute to the extraction of intra-canal rib head by linear regression analysis. The incidence of apical convex rib head penetration into the canal was 15.9 % (23/145). Only 14.8 % of the dislocated rib heads invaded into the concave half-circle of the spinal canal, which was reduced to 3.7 % postoperatively. The directions of rib head migration were mostly toward the anterior convex quadrant of the spinal canal (70.4 %). Paired sample t tests revealed significant reduction in intraspinal rib length (9.2 ± 3.6 vs. 5.2 ± 3.6 mm, p < 0.001) and improvement in distance between the rib head tip and the most concave spot of the spinal canal (DRCSSC) (14.2 ± 2.6 vs. 18.1 ± 3.3 mm, p < 0.001). Change of rib-vertebrae angle (RVA) was demonstrated to be positively correlated with reduction in intraspinal rib length (β = 0.534, p = 0.004), while Change of RVA (β = −0.460, p = 0.008) and vertebral translation (VT) (β = −0.381, p = 0.024) was negatively correlated with change of DRCSSC. Spontaneous migration of the dislocated rib head following posterior correction surgery resulted in shorter intraspinal rib length and larger uninvaded area. More correction of vertebral translation and rib-vertebrae angle could increase the degree of extraction from the spinal canal immediately after the surgery. S. Mao and B. Shi contributed equally to this work. This work was financially supported by the National Natural Science Foundation of China (81301603).